Look at this graph of the supposed inflation rate for the United States from August 2011 to August 2012 and ask yourself is inflation actually going DOWN or UP? Is your money buying more lately – or less? Do you know WHY inflation appears to be going down in this graph? I do. Because the government took out the two things that are most important to every American: fuel and food. NOT COUNTED in the official rate of inflation! You can read more about how inflation is calculated in Bankrate’s Is Inflation Higher Than You Think? Now you know why the phrase “Lies, Damn Lies, and Statistics” has been so popular for so long. And it is NOT just inflation rates where numbers are fudged to paint a rosier picture. Michael Lombardi, MBA, recently published a post that all Americans should study titled Real Inflation Out of Control in America? I consider it imperative that those willing to know the truth realize there can be no recovery because as more money is printed to cover debt, each dollar will continue to buy less and severe inflation will impact everyone – even those who still have high paying jobs so far. container has decreased, while the price hasn’t changed”. less veggies for example) AND the price has gone up. I am hearing that 70% of the corn crop is failing – and corn is in almost every item on a fast food menu and in most packaged foods sold in America. Corn and other crop shortages due to drought damage will greatly increase price while each dollar buys less and less – a double whammy that is going to lead to widespread hunger across America and elsewhere. “DES MOINES, Iowa – The U.S. Department of Agriculture on Thursday slightly lowered its projection for the nation’s corn crop for a fourth straight month, reflecting worse-than-expected news about the actual impact of this year’s withering drought from the farmers busy harvesting their fields. This is INTENTIONAL – which anyone can see because in spite of these shortages the government is mandating that we burn corn as fuel. Eating must come before driving – and ethanol consumes more fuel that it creates – so diverting a food staple to be burnt as fuel makes NO SENSE AT ALL. Unemployment figures are also fantasy and do not include those who have been unemployed over X time, nor those who took part time jobs because they can not find full time jobs much less those who are underemployed at jobs that pay only a fraction of what they once made. On top of that, in most cases they lost benefits and a real pension and now earn much less and have no benefits at all! This fictional video shares one possible scenario. I hope you will watch it – and then read my solution under the video. Yes, this is all bad news and no, there really is nothing anyone can do to stop it from happening eventually. Inflation or depression or both are what always happen when you use a debt-based currency. But there IS a solution and many are already implementing it: self-sufficient communities that support small businesses. 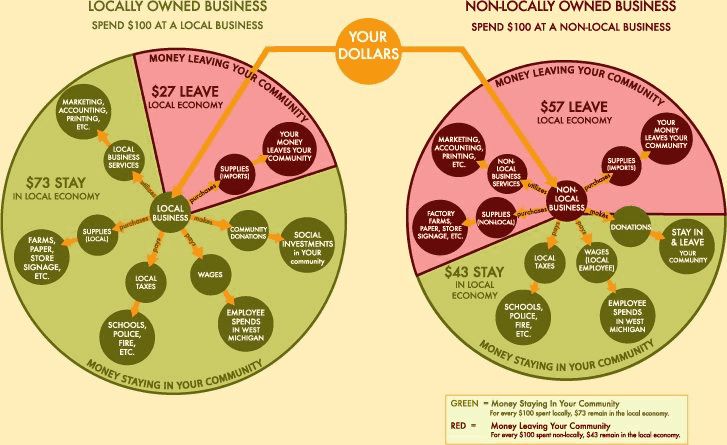 If consumers stop supporting multi-national corporations and instead buy what they need from small local businesses they can create stronger longer economies where people are paid a living wage and can maintain their standard of living. If we do this fast enough, when the dollar becomes worthless they will be self-supporting and can barter or trade for necessities. As you can see from the statistics above, $30 more stays in your community and supports local jobs that are more likely to pay a living wage. Those businesses also pay more in taxes than the big brands that simultaneously transfer costs of doing business ONTO taxpayers AND are given incentives which wave them paying taxes. Because of Wal-mart there have been many studies undertaken that clearly show the economic impact of big brands. Currently there are growing local movements and you can see evidence of this by searching for the hashtags #BuyLocal #ShopLocal #EatLocal and many others on Twitter. If more money is spent locally we can then encourage local businesses to also SOURCE locally – and that will create jobs and insulate you from higher transportation costs driving up the price of food. they have to be constantly replaced and be willing to pay reasonable prices. Corporations transfer their liabilities to taxpayers and take their profits offshore, pay for tax loopholes that allow them to avoid paying taxes, violate human rights and operate on policies of unlimited greed. we must stop wanting to be children all our lives and return to our self-sustaining roots! The government is NOT going to save us or protect us. Historically, governments do a poor job of most everything they do except grow their control and cost beyond reason. WE must save ourselves – at least those few wise enough to act now can. The rest will have already gone back to sleep before you finished reading this post. They prefer to listen to those who tell them what they want to hear. If you want more information, there are many videos on YouTube to teach you whatever you need to know and sharing how to live sustainably and prepare for what is coming.I have saved many in my YouTube economy channel. I especially recommend the one on Downward Class Migration. At a bare minimum, make sure you have food and necessities stored in your home. There are no stockpiles of food in grocery stores – there are usually only a few pallets in the back and what you see on the shelves is all there is. Food prices will keep climbing so the best place for your money is in food and other necessities because ANYTHING that damages roads or prevents trucks from delivering will create immediate food shortages in your area.